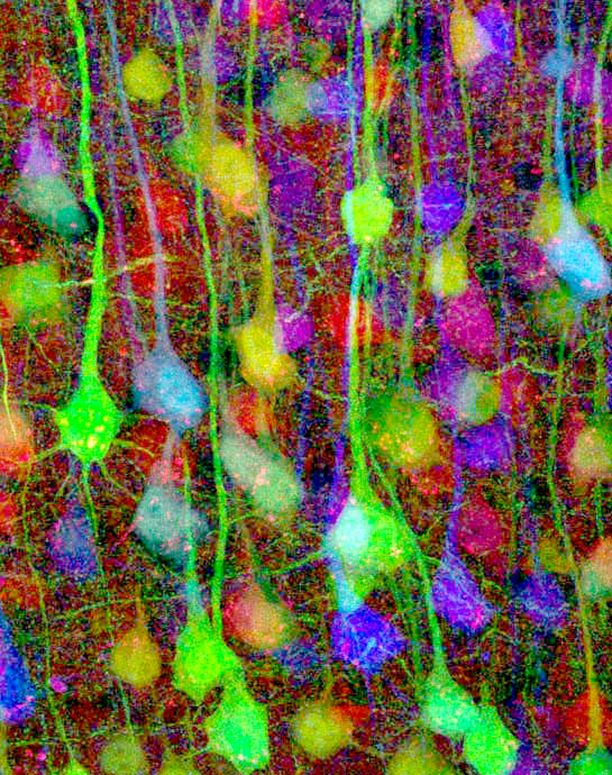 Image of brain tissue taken from the neocortex. The bright surfaces are sections of extremely small blood vessels. The two dark spots are the cluttered genes of two different neurons. The first membrane around the dark spot is the cell’s nucleus, the second is the cell body. All small circles and other shapes in the image are sections of densely packed neural projections — axons and dendrites — that run more or less perpendicular to the imaging plane. In the image the tiny dark spots that appear within many of the projections are the neurons’ mitochondria, the cell’s energy factories. Their huge number reflects the fact that brain consumes a lot of energy: up to 30% of the body’s energy. The image width corresponds to approximately 0.016 inches (0.4 mm).